Spiders are abundant here in Southwest Florida, but they don’t have to a part of your lifestyle. Almost all Spiders found in Florida are harmless to humans and most species do not attempt to bite unless they are provoked. Spiders usually remain hidden and do not seek out humans to bite. Most Spiders cannot penetrate the skin of a human with their fangs. Almost all Spiders possess venom, but only a few are considered dangerous to humans. Spiders are of interest to us since some of them invade homes, others are considered poisonous, and some larger species are raised as pets. Several species of Spiders enter homes and become a nuisance. Many people simply dislike Spiders and cannot tolerate their presence. They can be annoying because they construct webs. Abandoned webs collect dust, resulting in cobwebs. Spiders are considered beneficial because they do feed on insect pests and other spiders. Spiders can live a long time between feedings. Some Spiders can live up to 2 years without a feeding. Most Spiders build webs to trap flying insects. Web building Spiders may build several webs per year and abandon them. These webs are produced form glands on the Spiders abdomen. The web silk is a liquid which hardens when exposed to the air. This silk webbing is used to construct webs, safety lines, egg sacs, and as a parachute to aid long distance travel. Other types of Spiders search for their prey. Then hide and wait for them to pass. As their prey passes they will jump on or chase their prey down before biting them with their fangs. These types of Spiders are called hunting Spiders. Spiders can be identified by their having 8 legs and only 2 body segments. This means they are not an insect but a member of the arachnid family. Spiders lay eggs in a silken egg sac. This egg sac is either carried around by the female or hidden in the web. Egg sacs of very large Spiders can contain up to several hundred eggs. Spider eggs hatch in about 2 to 3 weeks. Most young Spiders mature to adults. Newly hatched Spiders are so tiny they easily enter homes through screens or around loose fitting doors and windows. Male and female Spiders live separately and only come together to mate. Male Spiders are usually smaller and color-marked differently than females. Controlling Spiders indoors may involve nothing more than vacuuming up the Spiders and webs. Outside Spider control could involve sweeping down Spiders and webs or pressure cleaning the exterior of your home. Keeping outside lights turned off will eliminate attracting insects which will draw Spiders to those areas. 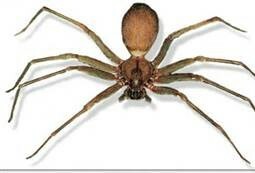 Collier Pest Control’s Spider treatment will eliminate unwanted Spiders and their webs for a period of 6 months. We will treat all the areas Spiders will cling and make webs such as; the eaves, soffits, doors, windows, gutters, garage, construction décor changes in the walls, and your pool cage. We can keep your home as pristine clean as the day it was built.